Oakgrove's Under-16 Gaelic footballers, Sarah Miller, Aoife Donaghy, Lucy Farren (captain U16) and Grace Donaghey pictured with PE teacher, Catherine Fletcher, who represents Derry Ladies in the All Ireland Junior Final at Croke Park this Sunday. CATHERINE Fletcher was reduced to tears and left ‘heartbroken’ when she was advised to hang up her boots after fracturing an ankle representing Derry at the start of the season. Derry Ladies defender, Catherine Fletcher playing for her club, St Eunan's. At 38, facing a devastating injury and a long term rehabilitation programme, most would’ve accepted the death knell had sounded on their county career. But Catherine’s no ordinary 38 year-old as she continues to defy the hands of ‘father time’ just four months on from being told she should retire. Incredibly she made her inter-county debut just 12 months ago in the Ulster Final against Antrim - a mere four years after being introduced to the sport! She certainly doesn’t take the conventional approach. As she puts it, ‘there’s not many 37 year-olds playing Gaelic football, never mind making their county debut in the Ulster Final’. A PE teacher at Oakgrove Intergrated College, the mum of two young children is living proof you should never let go of your sporting ambitions as she now prepares to line out for the Oak Leaf Ladies in Sunday’s All Ireland Junior Final against Fermanagh at Croke Park. The Derry corner-back wants to show her students that ‘if you want something enough and work hard enough, you can achieve it’ as she bids to bring the All Ireland trophy back to the Gransha based school next week. Originally from Ballymagroarty, Catherine has been living in Letterkenny for the past 14 years where she now represents St Eunan’s at club level. She’s been involved in sport from an early age, represented N. Ireland Senior Netball team in the World Championships in New Zealand back in 1999 and has bagged All Ireland medals at both junior and intermediate levels with Lagan Harps Football Club. And so when she sat in a lonely dressing room in Longford last January after snapping her ankle 15 minutes into Derry’s first league game of the season, challenging for an All-Ireland medal was furthermost from her thoughts. After consulting with her physio, she was told she shouldn’t kick another ball, never mind represent her county but she refused to accept that unwelcome diagnosis and went in search of a second opinion which would give her a green light to continue playing the sport. And when she heard the news she was waiting for, Catherine fought her way back into the county set-up and will proudly be among the Derry Ladies panel who will line out at GAA Headquarters this Sunday morning. “It’s been really frustrating and disappointing but I stuck with the rehab and got a second opinion and here I am, still involved and we’re in an All Ireland Final. “That day in Longford, I was stretchered off and at half-time there were tears running down my face. I thought that was me done. I knew it was broken, I heard it and thought, ‘I’m not coming back from this’. “Then, to be told to stop playing, I remember going out to the car to my husband and crying thinking, ‘This is me done’. I’ve played sport my whole life and to be told you can’t do it anymore was devastating. 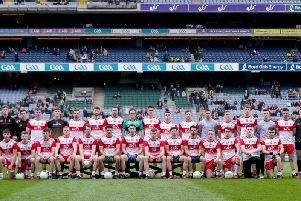 It’s exactly that attitude which has saw this talented Derry team defy both the odds and the critics and reach the All Ireland Junior decider this year. Catherine credits that achievement to coaches, Paul Hasson and Sean Laverty who embedded a real belief and a winning mindset in the team. Sunday’s opponents, Fermanagh have already registered FOUR victories over this Oak Leaf side this season including in the Ulster Junior Final at Clones last June. That’s the measure of the task facing Catherine and her teammates but the Derry defender has warned the Ernesiders they will meet a very different Oak Leaf outfit when they re-engage in battle at ‘Croker’. “We’ve played Fermanagh four times this year already and they’ve beat us every time, although the scorelines didn’t really reflect the games. We’ve done video analysis and there’s very little between the two teams. Nobody expected us to get this far and we’re just taking it as another game nobody expects us to win. It’s such an achievement to get to an All Ireland Final but we don’t want to stop at that. We don’t just want to be in a final, we want to win it! And the achievement is particularly impressive given the former Derry City Ladies FC player’s late conversion to Gaelic Football! Catherine has illustrated admirable traits in her bid to return to the county panel following such a devastating injury but her teammates surely don’t approve of her allegiance to the Donegal. Perhaps a ‘good luck’ message from Donegal All Ireland winner and All Star forward, Michael Murphy, will soften the blow! Her husband Keith, daughter Caitlin (10) and son Kian (8) are immensely proud of Catherine’s achievements in the sport she began playing just five years ago and they’re excited about seeing her play on the biggest stage in the country this weekend.